To get a good feel for what Leroy & Eli are about, all you need to do is click through to their Instagram account Tres_Bourgeois, which is basically their mood board. You can see an account of what they are loving, what they are judging and what is inspiring them. Leroy & Eli are a Melbourne based design duo who launched their label with their debut 'Pre-Collection' in 2016 titled 'Think for Yourself' which was inspired by "the unrealistic lifestyle expectations that most would like to attain". The collection featured t-shirts emblazoned with "BROADBEACH" and "LEATHER PANTS ARE UNFORGIVABLE UNLESS YOU'RE CANDICE SWANEPOEL" and another called "TRUSTFUND". Ahead of the launch of their latest collection SS18 "Beware of the Bourgeoisie" we sat down with them for a chat to get to know them a bit better. What is Leroy & Eli about, in three words? How did your brand come about, was starting your own label something you always had in mind? It initially came about from Leroy's sketches, mixed with an unhealthy obsession with luxury clothes. Neither of us have a trained fashion background so we worked with what we have, which is a sense of humour and strong opposition for anything typical. From there Leroy & Eli was born. What was the motivation behind the concept of making statement tees? We both have an obsession with t-shirts fit, colours, textures. So after years and years of research or some might call it shopping, we never found anything that resembled ‘us’ so to speak. We didn’t initially intend to make statement t-shirts, but deriving from our own personal style, we realised there's always a central focal point to every ensemble. We liked the idea of having a meaning behind every garment, through that we discovered that we have a lot to say, and t-shirts provided us with a canvas to communicate how we see the world. Whether it is to make you laugh, cry, or question the world you live in, if it evokes some kind of emotion, then Leroy & Eli have done what Leroy & Eli set out to do. 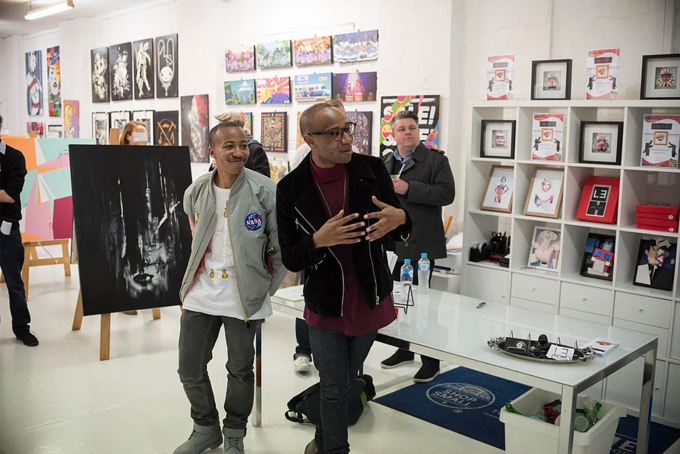 Your launch and art exhibition was a fresh display of pop-culture inspired artwork with an array of colour. Where do you go for inspiration? 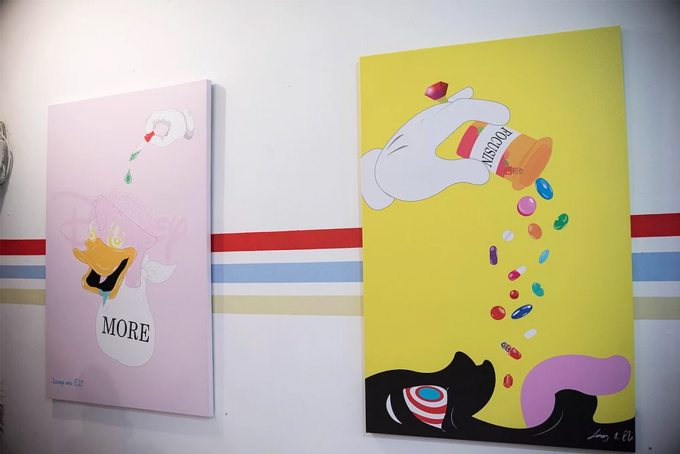 For the “Think For Yourself” pre-collection we sought a lot of inspiration from the influence of television, new age music, Disney, childhood cartoons, even 19th century art works (refer to the “Pyramid of capitalism” canvas). For the pre-collection we really had to dive in deep into the world of pop culture and dissect how we are influenced to think, this cultivation of a mass personality and where it stems from. Through the use of canvases and t-shirts I hope we communicated our message as clearly as possible. …any individuals who influenced the label? There's a few, our parents played a huge role on how our sense of style, how we think and how to be streetwise and intelligent. They probably don't even realise that, we actually dedicated our pre-collection "Think For Yourself" SS18 to them. And one of the most important influences to us, would be a very dear friend DA ROCHA, for her patience and guidance, we will be forever grateful. What is the essence of street wear in your eyes, is individuality and attitude something that is important to you? The essence of street wear is a sense of freedom of expression. Individuality and attitude are very important to us when it comes to style. A lot of kids today don't wear whatever they think looks ‘PHRA$H’ so they end up wearing the most hyped up brand and following suit. It’s fine to wear the trendiest brands, but we believe you should add something to your ensemble that reflects who you are, like a baseball cap you’ve had since you were six years old or a Japanese brand no one has heard of. Dressing for yourself and not seeking approval from anyone, when it comes to your style, will make you feel good about yourself and you will exude confidence. What is your preferred working space, where do you find your creativity unleashes best? There is no actual particular space where we feel as if we “release” our creativity. We are constantly discussing new ideas wherever we are. I think a space where we spend most of our time discussing ideas would probably be in the car when we’re stuck in traffic (as odd as that may sound). How do you find working along side a sibling? Many disagreements, or would you say it makes the process a whole lot easier? Overall neither of us can envision working with anyone else. We tend to be on the same wavelength 90% of the time. We don’t really tend to disagree a lot, usually if any disagreement emerges whomever is the most passionate about their opinion is often the one who’s correct. It all kinda moulds together harmoniously in a way. I think it makes the designing process a whole lot easier! We don’t need to explain much because we understand the same references and we both comprehend the message we are trying to send. What are your thoughts on making mistakes during the early days, have you been met with many challenges so far? "If at first you don't succeed, dust yourself and try again." Mistakes are the best part of starting out, because the truth is you have no idea what you're doing , because you've never done it before, it's all trial and error. From printing our first ever prints on 100% polyester (yes you read that correctly) t-shirts, to going through more name changes than Puff Daddy, you can afford to make those mistakes in the beginning. You learn very early on that EVERYTHING is your responsibility. The challenges are endless, it doesn't get easier as you go, for every problem you solve, you create ten more. However that is part of the thrill, if you're passionate about something, there's very little that will discourage you. What areas of establishing your own label interest you at the moment? As we are still establishing Leroy & Eli, all aspects of the process are interesting. But at the moment we have been dabbling in film to accent our upcoming collection "Beware of the Bourgeoisie" SS18, networking and meeting like minded people who have faced similar challenges, shooting our own images and exploring working closely with our manufacturers and seamstresses. How do you like to make the most of your day? Try to make sure we have fun with everything we do, no matter how tedious the task. What is your go to song of choice? Where do you hope to see your brand in the next few years? Are you pleased with the pace of things at the moment? In the next few years, hopefully Leroy & Eli will be in Colette, Lane Crawford and Dover St Market. Exploring other avenues of menswear shoes, skateboards, accessories. If none of the aforementioned hopes come to fruition still designing and influencing the society around us, even to the slightest degree would bring us a great sense of accomplishment. We are pleased with the pace, as we want to grow organically and avoid the 'too much hype, too soon' curse. Lastly, any advice for future fashion entrepreneur wannabe’s? We are still learning ourselves but thus far, don't give up, do your research, don't be afraid to ask for help and when in doubt...pout.